Life in the fast lane…. 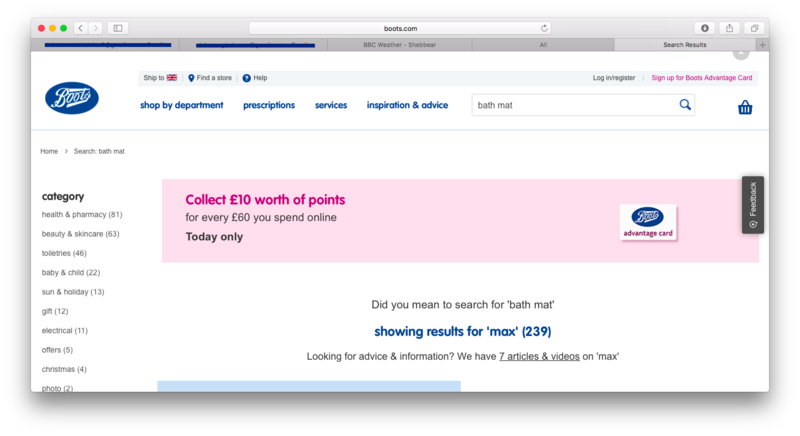 Who would have thought that purchasing a new bath mat could be so complicated, and that it would lead to me trawling through online dictionaries, wasting hours of time, when I could have been soaking in a…er… hot bath. It all started at Boots.com [the UK department store, which sells lotions and potions and all things smelly… talking of smelly, Mr Beastie has briefly resurfaced] whereupon I entered the words ‘bath’ and ‘mat’ in the search box. Please see exhibit A – click to make big. ‘Did you mean to search for Bath Mat? 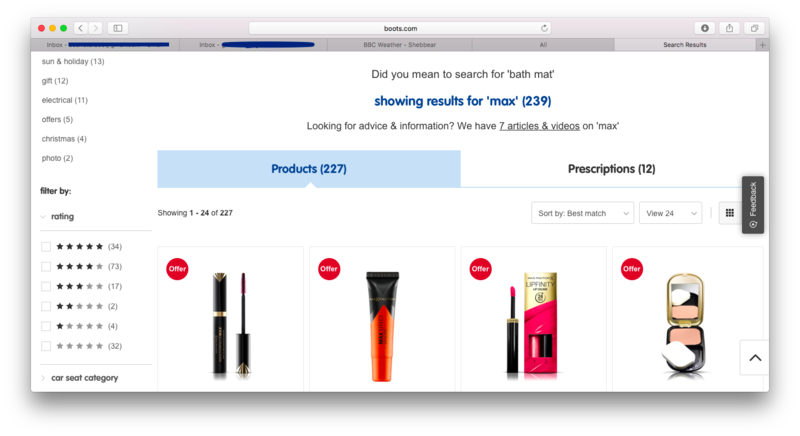 Showing results for ‘max”, replied Boots.com. BUT I DID SEARCH FOR BATH MAT, I howled at the screen. I looked at the search box carefully. I scrutinised it, perhaps I’d typed in ‘enormous maximus’ by mistake as I am wont to do. It seems that Boots were not used to me enquiring about anything so prosaic as a bath mat. Why was I not indulging myself with cosmetics and tooth whitener as I usually do? Boots obviously thought it knew me better. Please see exhibit B – click to make big. I then had a brain wave, perhaps ‘bath mat’ is all one word… et voilà…. I found the virtual bathmat aisle. So I thought: fair enough, now I know that bathmat is one word…. but of course I had to check AND ALL THE DICTIONARIES DISAGREE. *WordPress doesn’t seem to like it; my Apple dictionary says NO. My Collins Gem dictionary has no trace of ‘bathmat’. Google seems confused. I am none the wiser…. but does it really matter? Who cares how it’s spelt, all that matters is that I don’t slip in the bath and bruise my buttocks whilst taking a shower. I CARE. I BLOODY CARE. WHO AM I KIDDING TO SAY THAT I DON’T???????????? I WANT A DEFINITIVE ANSWER AND I WANT IT NOW. AND IF BATHMAT IS TWO WORDS I CAN WRITE TO BOOTS AND TELL THEM THEY ARE WRONG. WRONG. WRONG. WRONG. WRONG. WHAT RIGHT HAVE THEY GOT TO BASTARDISE THE ENGLISH LANGUAGE FOR THE SAKE OF THEIR NONSENSICAL STUPID FRUSTRATING STUPID DAFT BUGGERING ALGORITHMS????? …and breathe. Life has been a tad stressful lately. I will now log off and feed the dog. *To be fair, WordPress doesn’t seem keen on ‘Bastardise’ and ‘Buggering’ either, so it doesn’t know everything. This entry was posted in Personal, Silliness and tagged bath mat, bathmat, Boots.com, stupid algorithms on October 19, 2017 by Scarlet. Am I to understand that you want an “enormous maximus”? Sounds unwieldy. According to the Big Red Book (Chambers Dictionary Revised 13th Edition, the crossword solver’s sacred text) it’s two discrete words, but the OED favours a rakish hyphen. Neither, it seems, is prepared to countenance a bathmat, although the latter is happy with a mousemat. Not a mousepad, however. One gets the feeling that one has been lured into a linguistic minefield. Should I have written ‘as I am want to do’ ? I will tinker with it later. But THANK YOU, Mr Batarde! I will take this as a definitive answer and start scratching out a letter to Boots…. or I could simply send them a link to this post. I must admit that I originally wrote ‘brainwave’ until WordPress ticked me off. It is indeed a minefield. Behind WordPress stands Automattic Inc., an USAmerican enterprise sitting in San Francisco. They use generally USAmerican rules & orthography in their autocorrect function. In German we have the possibility to construct new words. If I wanted to read the rules I would look into the DUDEN, today a set of books that presents the guidelines, from basic rules to more or less sophisticated refinements, including grammar. From the article “English Compound“. The definitive answer is that there is no definitive answer. Set your own rules. Good point, Mr Mags! Lipstick! Thank you, Jon! Of course it is ‘wont’! I am in the process of trying to get my brain to work again. I am not quite there yet, as you can see. I will make corrections as soon as. Shop?? A shop?? Well that is a novel thought! Grrrrr…. to the algorithms, Dinah, Boots aren’t the only ones who have made me search in vain and have made me question my spellinges. But yes! Boots still sell the No 7 range! I am using their face creams at the moment…. I am not sure about the eyelash dye, but I am thinking of writing a post about the importance of eyelash conditioner. I am now going to check that eyelash is one word. Oh, god. I have been worrying about sideboards all afternoon. And now this! The little dictionary.com widget on my browser happily accepts “bathmat” and gives the definition. But if one clicks for more information, it takes me to the dictionary.com website and has it as “bath mat!” Most, but not all, of the online references has it as two words. But wiktionary.org has it as one word and lists the two-word version as an alternate spelling. Bath mat etiquette! I will save this for later, Mr Lax…. as I feel a headache coming on…PLUS, Mr Beastie has written another post. It’s all getting too much. I am going to stick with my original thoughts, and natural inclination, and use the two separate word method and go with bath mat. It appears Mr. Lax found the same surprising article about bath mat etiquette as I did when searching “bath mat”. What a waste of a read this first world problem of using a bath mat. In case you didn’t waste time to read it, the mat in this case is the mat outside of the tub/shower where you might first place your wet foot. This discussion is not about the word(s) but how to exit the tub/shower. 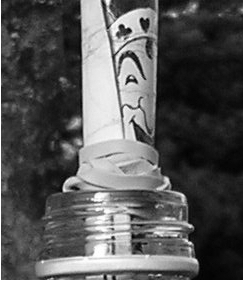 The write-up has the level of importance as those online discussions of the proper way to place toilet paper on the holder. Considering the lack of clean water, availability of toilets, and the many desperate situations in the world, I wonder why these little things matter. Do our minds focus on little things, minor details because the internet has exposed us to the magnitude of problems found in the far reaches of the globe? I certainly would rather post thoughts about odd insignificant ideas/thoughts than take on meaningful issues. If we have taken a bath/shower we can be experts on bath mats. Thanks for letting me clear my head a bit here. Bill…. I think I like to focus on the things that I can do something about…. the small stuff is easier! I don’t mean to overcomplicate things even more than they already are, but what type of bath mat (BATH MAT – two words, bloody Boots!!!)? The rubbery type with octopus suckers on the underneath that one actually puts in the actual bath? Or the thick, fluffy towel-like one that is for stepping on when one vacates said bath, actual or otherwise? Actually, actual. Maybe I should call it the Octopus Sucker Mat, Mr Devine. This would be simplest…. Christ knows what the soppy algorithms will make of that. The outside mat can simply be called fluffy mini mat for soft exit. Mr Beastie has written another post. It is about last Christmas, he is taking each day as it comes whilst frantically trying to catch up in a steady manner. Mr. Beastie will not be bothered with this post as he does not bathe. Ah… yes, you are correct Ms Mistress! He has never had the need for a bath mat, inner or outer. He is probably unaware of the shopping emporium known as Boots. Good job you didn’t search for bath rug; Boots may have shown 256 results for how to wash and rinse a toupee. Well John, you seem to have cracked it! Sadly the results from ‘bath rug’ do not relate to toupees…. instead the results give me exactly what I was originally searching for, i.e. rubber bath mats!! A “Amazon Bestseller” is the “Non-slip Microfiber Shag Bathroom Mat” in dark grey. But “microfiber shag” is surely not as satisfying as “octopus sucker” ? Mr Mags – Sadly, microfiber shags are not available in the UK. I dispute this! I will endeavour to find out, Mr Beastie! Blimey, you found me! I hope you found the right bath mat or, at the very least, got to enjoy a good soak after all that hassle. Interestingly enough, I refer to in the tub mat as a shower mat; the bath mat is what you step on out of the tub to dry off. Otherwise, the use of the words “slip resistant” bath mat refers to the non-slip, suction type shower mat used inside the tub. Mr Swings – The problem with slip resistance is that it causes chaffing. Apparently I should have used ‘bath rug’ in the search box to find exactly what I wanted. Rug???? Who puts a rug in the bath????? Okay, calm down, many English words have alternative spellings (including whether there’s a space in the middle) so you might as well just go with whatever variation does the trick. Life is too short for linguistic squabbles. Better to focus one’s energies on eating ice cream and chocolate truffles and sipping pinot grigio. I wish the internet wasn’t systematically destroying retail stores. Had you walked to your nearest Boots (a preposterous name), you surely wouldn’t have found cosmetics in the bathmat aisle. Remember when the promise of new technology and the internet was so set us free? Stop right there, Monsieur Pain!!!! Let’s check how far it is for me to walk to my nearest Boots…. Okay…. so you want me to walk 6.8miles to get a bath mat???!!! And therefore 6.8 miles back again????!!!!! I will buy some corn plasters whilst I’m there. But I do understand your point. P.S All my shops are 6.8 miles away. Not even a newsagent within spitting distance. Bill…. so you want to go back to Roman times? One the places I enjoyed visiting while in England was Bath. The Romans were good at plumbing. Sure we could bring back some of the better things from the Roman times as long as I get to control the hot water. Washing with cold water on a cold day is just miserable. No bath in this house, only a shower which has a textured surface (bugger to clean) so I no longer require an octopus-sucker-mat. I do miss the joy of ripping it from the bath’s bottom after use. Eryl – I loathe sticking the bath mat back down again after it’s been ripped off…. and it reminds me of a giant sticking plaster when I rip it off, so I always wince a bit when I do it! No… I haven’t written to Boots yet… but I should… maybe I’ll just write a spiky review pointing out their error online. As a member of the Apostrophe Protection Society (Facebook), I am with you on this one. It drives me NUTS the way people misuse language, especially when it is wont to cause confusion (see what I did there?) and the bath mat/bathmat thing is a case in point. IF they had written it correctly, you wouldn’t have got frustrated. Of course, you wouldn’t have had a blog post then, either, but there you go! Hello and welcome, Jay! I did see what you did there and I am still cringing over my ‘wont’ error. How silly of me. What annoys me the most is that I convinced myself that Boots was right and I was wrong! I do think that these large retail sites do have a responsibility to use English correctly… I could have gone merrily on my way using ‘bathmat’ willy nilly all over the place corrupting others as I went. It’s a good job I checked. Well you’ve got me thinking now, which is not easy to do I can tell you, unless catering is the subject of conversation. Is there such a thing as a “Slip of the dictionary?” If there is this may be what Boots are guilty of, or even worse, not even consulting a dictionary before putting out the advertisement. With regard to slipping in the bathroom ( one word apparently,) that is best avoided as they often sport hard tiles which are not gentle when contacted at speed. Hello, Mr Ducks…. catering? Now that it’s almost a week since I published this post I feel that I too would rather talk about bowls of crisps, sausage rolls, and canapés. Shall we move on then, to something more appetising?? My dear Ms Scarlet – you disappoint me. In my mind you are far too young to be bothering about bath mats, orthography and the deficiencies of Boots (alas, going to pot in more ways than we imagine once the modern asset-strippers got their hands on the proud heritage of Jesse and Florence), and certainly young enough to have good balance when it comes to slippery baths. Goodness me, I still manage without rubber suckers, at the age of mumblety-nine. She was up in the bath, so she could not come down. Well, she slipped on the soap, and she did come down quick. By the way “Buggering algorithms” could be the title – and indeed the mission statement – for an interesting blog. STOP right there, Mr Auty!!!!! Who said the bath mat was for me???? Hmmmmm???? [Perhaps because there is a crossed out line in the post that says something about slipping and bruised buttocks?] Well…. I sometimes have to stand on one leg in the bath and I am not risking that on a slippery surface AND the bath mat is also for the dog – we don’t have baths together. He is too grubby. I am now away to start a new blog….. So moving forward, did you order the bath mat? Did you receive it? Was it satisfactory? Was it the bath mat of your dreams? Who needs a bath mat anyway? I just use a towel.